I started raising aviary birds in 1949 and believed since I had mastered the beautiful little Cuban Melodias finch, that I could master the larger Lady Gouldian Finch. In 1955 I bought my first pair of Lady Goulds in Rosemead, California from a Mr. Bauer. Bauers Aviaries in those years had everything from Goulds to Parrots. He spent time explaining birds, their habits, and their seed requirements. They died that night. The elder gentleman told me to take one of his Zebra finches home, and if it died, then there was a gas leak in the home. I took him at his word and took the Zebra home. It died during the night. The gas pilot light was out in the furnace next to the 3 x 3 x 3 aviary my father had made and set on a card table in my bedroom, where we had hopes the Goulds would nest. I followed my Dad around as he raised and flew Homing Pigeons. He was SGV champion in 500 and 200 mile races. He displayed his trophies proudly throughout the den. Dad always said, "The last thing I want is a dead pigeon." He wanted the birds to be bred indoors since he was so afraid of Parrot Fever. He read me articles where Parrot Fever wiped out hundred of birds and how dangerous it was. He also insisted we were never to have anything near those pigeons. Later on he discovered the birds DID NOT have the Parrot Fever. 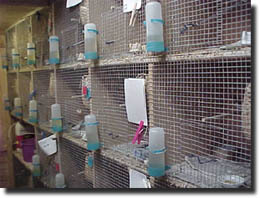 One experiment lead to another until we had hundreds of all types of finches filling the aviaries he constructed. Beauty was the name; raising them was a game! At 80 dad died, leaving me over 100 red factor Canaries and 1 old pigeon that he claimed to be 40 years old. He always smiled when he told the story of that old bird 22 (it�s band number-SGV 22,1970. 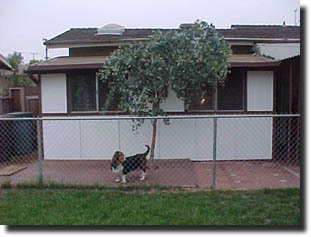 Brenda the Basset Hound has been my bird catcher since she was a pup. She feeds and cleans the birds with me every morning and evening. I taught Brenda to chase any loose bird and retreive it for me, without hurting them. She does a remarkable job. I have video of Brenda jumping four feet into mid air and catching the escaped Gould as it tries to fly away. She simply returns it and awaits while I clean the next escapee. "Eight Years and Not One Gouldian Egg"
We wanted the Goulds separated as Mr. Bauer had instructed. The Goulds lived for about 8 years, never laid, never did anything. Just sat there and looked beautiful and ate. Since they were so beautiful, we allowed it. In 1980 I decided it was time to cut back on the Canaries and to try my luck with the beautiful Gouldians again. 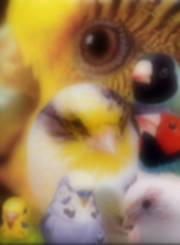 I hadn�t learned about Society Finches, so my efforts and time were almost wasted. I explained to my wife if I could make cages and replace the over sized cages I would be able to breed more birds. I told her I needed 30 cages on a 12 x 12 wall. The next weekend while I was at the Bird Mart, I came home to a greatful surprise. My wife purchased five 12� x 12" peg boards. She arranged them as a book case would be built. In between she built partitions out of the peg board and I had my 30 new clean Society Foster Cages. She used simply Aviary wire in the front, and cut out a space for the doors and cut larger wire to make the perfect fit. The cost was less than $100.00 and has more than served its purpose. Oh yes, my wife is a carpenter! 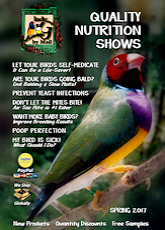 Then about 5 years ago, before Laraine became ladygouldian finch.com, I met her at a bird show. 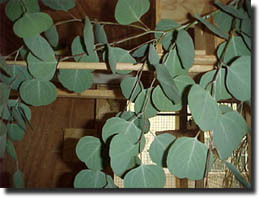 She gave me more information in one half hour than I had read in all the books I had purchased on the Gouldian Finches. I immediately asked to purchase some of her stock (in those days, there was not a wait list) and off I went to set up my birds. My Loft (in my day, anything housing birds without open wire to the outside was called a Bird Loft; anything in open space was called a Aviary) is constructed out of simple ply wood and 2 x 4�s. The Loft is 30 feet long, 18 feet wide and 9 feet tall. I ran the 2 x 4 �s two feet apart on all sides, including the top and the bottom. I didn�t use nails, only screws, to secure the framing. I set the Loft on large concrete blocks one foot by one foot (with holes in the middle of them) and set them three feet apart under the foundation studs. The roof and the floor are 1" plywood, and the sides are �" plywood- all insulated with roll insulation in the walls and roof. Naturally, I put plywood over the insulation inside the Loft, the ceiling and all four sides. I installed two windows on the front, which are 3� x 3�, and one on the side 2� x 3�. I reversed the windows so I could open them from outside. The windows are opened in the mornings by 6 a.m. and closed at 5 p.m. If it is raining or sunny, I adjust the opening and closing times accordingly. The Loft was created for the special purpose of being "draft free." I knew if I was going to raise perfect Gouldians, then this was idea of the perfect set up. On the inside of the Loft at the west end, I have built a 5� x 8� aviary. This houses 10 pair of Gouldians. Next to it I have constructed a Aviary that is 4� x 7�, which houses 8 pair of Owl finches. On the south wall I have 4� x 3� wire cages in which I put my youngsters. On the back wall (north side) I have 20 pair of Society Finches set up for fostering. The birds I purchased from ladygouldianfinch.com were superior. The first year I raised 186 young from two pair. Using Societies as fosters, I found these birds would lay twice a month. One female gave me 8 to 12 eggs per clutch while the other gave me 6 to 7 per clutch. The third year both hens died! When I called to give Laraine the news, the scolding began- no proper calcium in their diet, no proper supplements. She continued to scold and instruct. Today I have a very healthy bunch of Gouldians and Owl Finches because I do exactly what she instructed. Plus, my birds no longer lay all year around without molting. Oh yes, but that is another story. 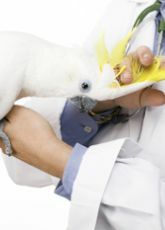 I also believe, however, my draft free aviary is also a key to healthy birds. nature and to ward off mites and bugs. The fragrance is also great!